You will find below the horoscope of Dreya Weber with her interactive chart, an excerpt of her astrological portrait and her planetary dominants. If you know the time of birth of Dreya Weber, we would appreciate it if you would send us your information with your source, at stars@astrotheme.com. To thank you for contributing to the enhancement of our astrological database, we shall be glad to send you the astrological portrait (34 pages) of this celebrity. Horoscopes having the same aspect Mars opposite Saturn (orb 1°31'): George Clooney, Robert Downey Jr., Vincent Cassel, Jean-Claude Van Damme, Sarah Jessica Parker, Jeff Buckley, Julianne Moore, Lolo Ferrari, Brooke Shields, Robert Smith (musician), Farrah Fawcett, Sophie Davant... Find all the celebrities having this aspect. Horoscopes having the same aspect Sun square Uranus (orb 3°50'): Shakira, Paris Hilton, Michelle Pfeiffer, Kate Moss, Stephen King, Yasmine Bleeth, Lenny Kravitz, RuPaul, Joseph Gordon-Levitt, Rob Kardashian, Christina Ricci, Brooke Shields... Find all the celebrities having this aspect. Celebrities clicked on in real-time: 576,607,435 times. Dreya Weber (born Andrea Weber; born May 8, 1961) is an American actress, producer and aerialist. She was born in Bloomington, Indiana, and attended Hunter College in New York. She performed aerial silks at the 2002 Winter Olympics in Salt Lake City. She has worked as an aerialist for entertainers including Madonna and Pink, for whom she choreographed several aerial acts including the performance of Pink at the 2010 Grammy Awards. She toured with Cher during her Living Proof farewell tour and choreographed all of the aerial routines. She is currently represented by McDonald Selznick Associates. She produced and stars in The Gymnast (film) (2006) which took home 28 festival awards, including Best Feature at Outfest, Newfest and Frameline, and demonstrated her aerialist skills. Here are some character traits from Dreya Weber's birth chart. This description is far from being comprehensive but it can shed light on his/her personality, which is still interesting for professional astrologers or astrology lovers. 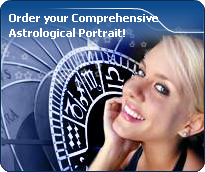 In a matter of minutes, you can get at your email address your astrological portrait (approximately 32 pages), a much more comprehensive report than this portrait of Dreya Weber. Warning: when the birth time is unknown, which is the case for Dreya Weber, a few paragraphs become irrelevant; distributions in hemispheres and quadrants are meaningless, so are dominant houses and houses' accentuations. Therefore, some chapters are removed from this part. Like the majority of Earth signs, Dreya Weber, you are efficient, concrete and not too emotional. What matters to you is what you see: you judge the tree by its fruits. Your ideas keep changing, words disappear, but actions and their consequences are visible and remain. Express your sensitivity, even if it means revealing your vulnerability. Emotions, energy and communication must not be neglected; concrete action is meaningless if it is not justified by your heart, your intellect or your enthusiasm. The predominance of Water signs indicates high sensitivity and elevation through feelings, Dreya Weber. Your heart and your emotions are your driving forces, and you can't do anything on Earth if you don't feel a strong affective charge (as a matter of fact, the word "feeling" is essential in your psychology). You need to love in order to understand, and to feel in order to take action, to the detriment of a certain vulnerability against which you should learn to fight. After this paragraph about dominant planets, of Dreya Weber, here are the character traits that you must read more carefully than the previous texts since they are very specific: the texts about dominant planets only give background information about the personality and remain quite general: they emphasize or, on the contrary, mitigate different particularities or facets of a personality. A human being is a complex whole and only bodies of texts can attempt to successfully figure out all the finer points. Your sensitivity is all on edge, Dreya Weber, and your emotions so deep, your imagination, so lively, that you are often found in the sweet realm of dreams. You create your own fantastical world with entangled fragments of current reality, romantic souvenirs and hidden hopes. Your receptiveness is so intense that it may border on mediumship or, more disturbing and rare, you may have hallucinations. Your character fluctuates according to the stimulation of the moment but in general, you are a nice person, full of gentleness and romanticism, always ready to understand and to dedicate yourself. You have real healing powers, would it be only through your ability to instinctively understand other people's sufferings. Your affective structures can be likened to a roving radar. You are vulnerable, hurt by the slightest aggression and easily influenced because you are unable to step back from people and events; therefore, you may start to be doubtful and lose the self-confidence that you so badly need to progress. Your mind is calm and balanced; even though you assimilate slowly, your memory is remarkable. Your judgment is based on reflection and reason and draws on past experiences. Dreya Weber, you are a good adviser, a reliable person whom people can confide in discreetly. You are full of good sense, cautious, methodical and disciplined and you are able to carry many good projects to a successful conclusion. You are very opinionated and determined in your actions. However, your tendency for intolerance and prejudices may offend your entourage. They wish that you exercised more flexibility instead of systematically refusing what cannot be immediately checked. You usually express yourself with a lot of charm and this is what allows you to get people to better accept your well-established habits. Love at first sight, flash in the pan, amorous impulsiveness? All these are part of your way of loving or to fall in love, Dreya Weber. Throughout your relationship, you maintain this kind of jerky and lively style, that may seem childish or naïve, but that is so generous and cheerful! You are undeniably possessive and you are not concerned with your partner's opinion but, fortunately, you readily forgive because of your spontaneity and your authenticity. When your relationship is intense, everything is fine. There is no romanticism, no complications with you. You love with ardour and, except for a few crazes and opportunities for new pastures here and there, the only danger may be that boredom settles in. In that case, you leave without regret and you quickly forget what consumed you, not so long ago. What an energy, Dreya Weber! You take so many initiatives, you have so much strength for action, construction and struggle! You are part of the conquerors, loyal and concerned about panache. Your vitality is such that you can achieve your objectives and release all your creativity. However, you are so proud and so unyielding that you cannot tolerate the faintest annoyance on your way: if you are vexed, you may turn into the opposite direction as a matter of reaction. Sexually, your magnetism and your energy work wonders. You are not complicated and, as long as your slightly domineering nature is respected and you are granted due admiration, all goes perfectly well. You usually have a lot of self-confidence and you believe in you. This characteristic feature may turn you into a hero with Hercules's strength and solar charisma. This text is only an excerpt from of Dreya Weber's portrait. We hope that it will arouse your curiosity, and that it will prompt you to deepen your knowledge of astrology, as well as to visit and use the wide range of free applications at www.astrotheme.com.